The following article is written by Master Kam Lau to explain Peng Jin. You may have wondered what it means or how can it be achieved? Another popular question is how a person of small stature is able uproot/overcome a person much larger than themselves? So how can this be achieved or explained? What exactly is this mysterious power? The key to begin to understand the above statement lies in the understanding of the "effectiveness of Peng-Jin". In traditional Tai Chi exercises of push hands, there are 8 techniques named Peng, Lu, Ji, Au, Cai, Lei, Zhou and Kao (mandarin pronounciations). These are the actual methods or skills applied and must not be mistaken for the unseen force behind the strength exhibited by masters of Peng-Jin. 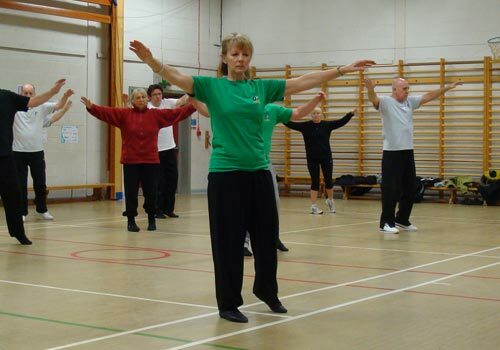 The old saying "four ounces can deflect a thousand pounds" is always associated with Tai Chi. However, this concept is not unique to Tai Chi as other Kung Fu disciplines have similar quotations depicting the same concept. More significantly, Tai Chi is not just the use of yielding and/or evasion techniques. It can also be used to resist and overpower external physical (brute) force as well. Q. How do we differentiate between the strength used in Kung Fu and that applied in Tai Chi? A. In most Kung Fu systems the power used can be described as being of a physical force or muscular strength, while Tai Chi relies upon Peng-Jin (internal power), better described as a spring-like/elastic force. Q. Can brute force and internal Peng-Jin be compared in another way? A. Yes! Brute force can be compared to a rigid rod of iron while Peng-Jin can be compared to a flexible bamboo tree. Q. What is the advantage of developing Peng-Jin? A. 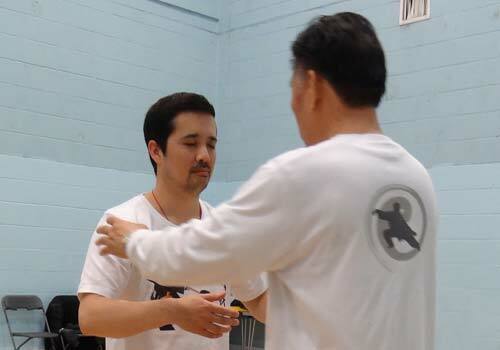 Apart from building an individual's confidence the power of Peng-Jin can be used to absorb and/or control an opponent's brute force, thus improving ones ability to defend oneself and/or overcome the opponent. Q. Are there different levels of Peng-Jin? A. Yes! However, these are dependent upon development by regular practice of form work, push hand exercises and other applications. If Peng-Jin is equated to an arrow then for it to be effective it has to be released from a bow. The more the practice the more powerful and the more effective the delivery. Q. Does the development of Peng-Jin make Tai Chi a superior or invincible martial art? A. No! There is no such thing as an invincible martial art system (who would wish to train and study a lesser form?!?!). Regardless of the martial art system, be it Tai Chi, Yi Chuan, Kung Fu, Karate etc ... the individual's level or skill factor depends upon his/her ability and understanding of his/her chosen martial art. However the development/possession of Peng-Jin is an advantage. Q. Has Peng-Jin any limitations? A. Yes! It cannot be applied in instances such as weight lifting or arm-wrestling etc ... where physical force is relied upon and can triumph. Q. How can the possession of Peng-Jin be identified? A. By taking part in a simple basic double push hands exercise with right wrists (or left) in contact and touching elbows with free hands using a circular motion (without the use of Peng, Lu, Jei and Au techniques, etc ...). If you are strong but tense, the presence of Peng-Jin will be revealed by the opponent's arms feeling soft but strong and heavy and also they will feel like a spring (the more power you apply, the more it reacts). The application of brute force alone will cause you to struggle against this oncoming power of repeating waves of elastic power. Peng-Jin will triumph over a physical force when such is pitted against it (this is but one example). Q. How is Peng-Jin described? A. Peng-Jin is an inner strength (internal force) and can be defined as the end result of the gradual process of neutralisation of an individual's physical force leading to the refinement and cultivation of tangible spring energy/strength. This description is solely based on my own personal training and experience. Follow here if you wish to see a practical Peng-Jin/Internal Power demonstration.